Click on the Red Riding Hood Sister to talk to her. You will receive your first task. Click on the mist wolf to make it disappear. Head up the path on the right. Click on the fireplace on the left to start a hidden object game. You will receive a RED RIDING HOOD FIGURINE. Click on the sign to zoom in. Use the SHARP STONE and you will receive the WOLF FIGURINE. Click on the ground near the door. Take the GREEN MARBLE EYE. Click on the archer to zoom in. Take the RED RIDING HOOD SISTER 1/4. Click on the roots where it's sparkling. First, click on all the buttons until they are showing moons. Then complete the pattern in the middle to two arrows facing right and a swirly circle figure. Then move the wolves so that each archer can shoot them. You will receive the SILVER MOON. Click on the doorway with the hanging roots, on the left. This will part the roots. Click on the hollow in the tree on the far left to zoom in. Use the LONG TWIG on the hollow. Head up the right path. Click on the stone structure on the right to zoom in. Use the PICKAX on the stone structure. Go back one screen then forward two screens, back to the Hollow Tree. Use the SILVER MOON and the GOLDEN MOON on the door. The flower on the right will bloom. Click on the flower to zoom in. Use the EMPTY VIAL on the flower. You will receive HERBAL MEDICINE. Click on the red riding sister to zoom in. Use the HERBAL MEDICINE on her. You will receive a RED RIDING HOOD KEY. Return to the hollow tree. Click on the doll house to zoom in. Use the RED RIDING HOOD FIGURINE on the tiny footprints. Use the WOLF FIGURINE on the wolf footprints. The door will open and reveal the lock. Use the RED RIDING HOOD KEY on the lock. Click on the sparkles on the right to access a hidden object scene. You will receive a BRONZE EAGLE. Move forward into the elevator. Once you get to the top, head to the right toward the waterfall. Click on the wolf on the right to zoom in. Take the RED RIDING HOOD SISTER 2/4. You will receive a HUNTER STATUE HEAD. Now, head up the right stairs. Click on the memorial to zoom in. Take the RED RIDING HOOD SISTER 3/4. Use the SILVER WINGS and the BRONZE EAGLE on the door. Click on the wolf to move it. Click on the cabinet on the left. Click on the sparkles on the right to start a puzzle. 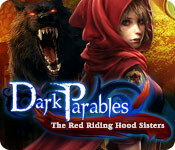 The goal of the puzzle is to get the right red riding hood sister with the right weapon. Once you are done, another puzzle will begin. This is a basic matching puzzle. Just click on two cards to reveal them and attempt to find matches. Take the HUNTERS STATUE BODY. Move back one screen and then head up the stairs again. Use the HUNTER STATUE BODY on the statue. Then use the HUNTER STATUE HEAD on the statue. Click on the mirror on the wall and watch the cut scene. You will receive a task to find Ruth. Take the POLISHED ARROW on the wall. Take the FANG on the table. Click on the bulletin board to zoom in. Click on the wolf to zoom in. Use the HANDLE on the hole next to the wolf head. Go through the door on the left to the training area. Click on the wolf on the wall. Use the 2 FANGS on the wolf. A wolf statue will rise out of the floor. Take the ORDER OF THE RED RIDING HOOD SISTERS 1/4. Click on the crest on the tree. Take the ORDER OF THE RED RIDING HOOD SISTERS 2/4. Click on the gate on the left to zoom in. Use the POLISHED ARROW and the ELEGANT SWORD on the gate. Use the CLOCK FACE and CLOCK HANDS on the cabinet and it will open. Move forward through the gate and into the observatory.